Young people have been known to lose things. It’s also not rare for adults to have lost track of items that meant a lot to them when they were in elementary school. It is unusual, however, when an adult wants to replace a Scouting award earned in the early 1960s. I recently received an email from a gentleman named Gerald Yancey. He and his brother, Michael, were awarded the Ad Altare Dei Catholic Scouting religious emblem in 1961, and he was hoping it would be possible for them to obtain replacements. 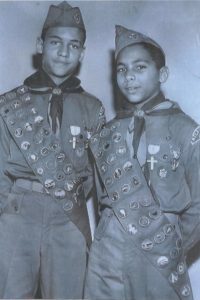 To substantiate their having earned the awards, he sent a picture of themselves in full uniform with their Ad Altare Dei and Eagle Scout medals (Left to Right: Michael and Gerald). Touched that the awards meant so much to them after all these years, I thought it would nice if Archbishop Wilton Gregory could re-present their awards to them. While making the arrangements, I had the opportunity to speak with Gerald and he shared more of his family’s history. After graduating from St. Paul of the Cross Elementary School in Atlanta, he and Michael were the first African-Americans to attend Marist School, a Catholic college prep school. Michael went on to Harvard and Duke University School of Medicine and recently retired after 41 years as a neurosurgeon. Gerald earned a degree from Georgetown before going on to Harvard Law School and the University of Pennsylvania Medical School. Despite being slowed by Lambert-Eaton Syndrome, he continues to serve as a medical-legal consultant. I was finally honored to meet Gerald and Michael as the Archbishop presented their medals at a ceremony at St. George Village Chapel in Roswell. 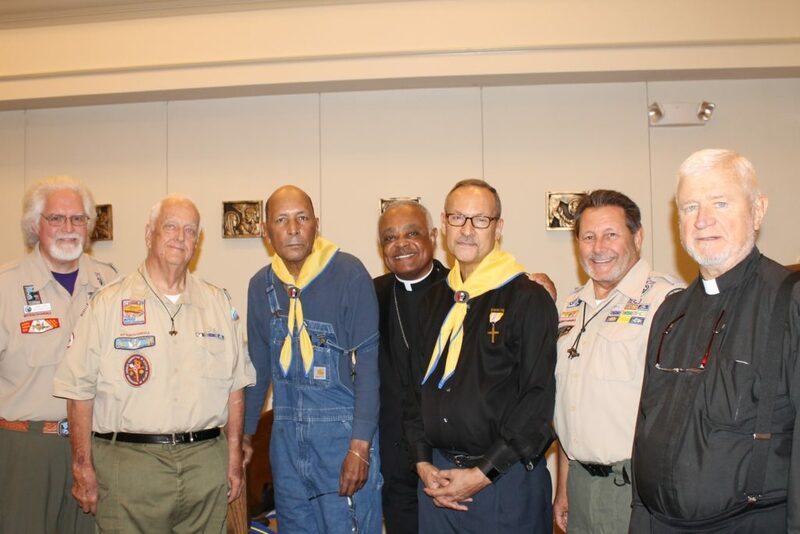 Left to Right: John Lyon, Chair, Atlanta Area Council Religious Relations Committee; Tommy Treat, former Chair, Archdiocese of Atlanta Catholic Committee on Scouting; Gerald Yancey; Archbishop Wilton Gregory; Michael Yancey; Phil Krajec, AACCoS Chair; Monsignor Bill Hoffman, AACCoS Chaplain Emeritus. This story was submitted by Phil Krajec of the Atlanta Archdiocese Catholic Committee, a long-time supporter of the Atlanta Area Council and countless Scouts in the metro-Atlanta area. Tagged Eagle Scout, Religious Emblem. Bookmark the permalink.